An important part of Chinese New Year is feasting, and lots of it. There's a lot of symbolism in the Chinese culture. 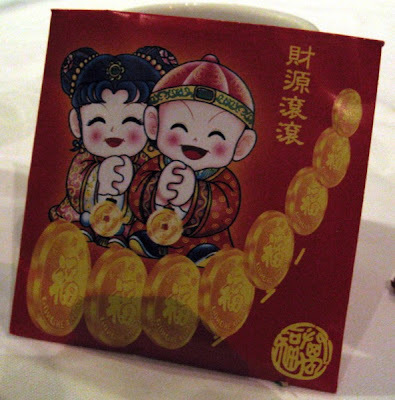 Lai see packets stuffed with money are given to people younger than you and singletons, though the above, kindly given to us by EuWen, were full of chocolate gold coins. To have a good year, auspicious foods should be eaten to help you along your way. Noodles symbolise longevity, black moss (more on that later) for wealth, whole fish served also symbolises prosperity, dumplings too. The Chinese like to be rich. The colour gold is seen everywhere (see previous point) as well as red, to be seen as lucky. An important part of the festivities is to visit your family and friends. Unfortunately my family had no plans and didn't really celebrate the new year, so I was pretty pleased when I was invited to a big Chinese New Year dinner, organised by A Rather Unusual Chinaman. 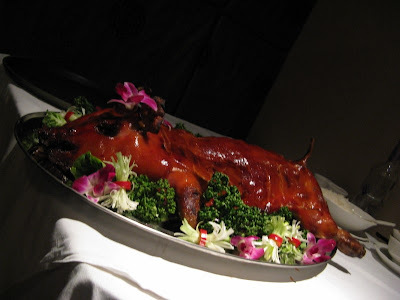 The main feature was to be whole suckling pig. I was beside myself with excitement. Firstly - Pearl Liang, our venue, is in the arse-end of nowhere. I relied on my iPhone like the fool I am and got quite lost in the streets of Paddington. The website has far better directions. We were led straight to the private dining room to host 18 of us. To start, we ordered the 'cold toss'. Cue much sniggering. 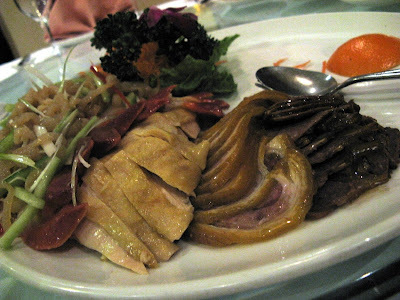 This was a platter of cold appetisers - sliced pig's knuckle was slightly chewy and well seasoned. Five spiced beef shin was surprisingly tender and very moreish. 'Artic clam' was chewy and fishy, and jellyfish, interspersed with slices of chilli, cucumber and spring onion, were heavily flavoured with sesame and were just as I like them; like chewing on rubber bands. The star of the platters was the drunken chicken. 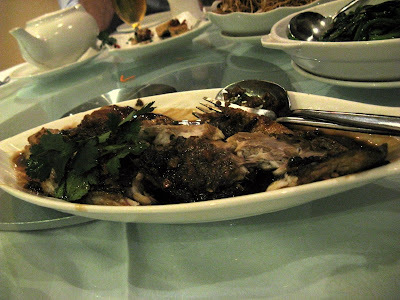 The chunks were flavoured through with Shaoxing rice wine and were so tender and juicy. Next, the two suckling pigs were paraded in, to be greeted by many cameras and "oohs". They were tantalisingly shiny, and the waitress looked as if the weight would buckle her arms. This was then taken away to be portioned up. Upon its return, big steamers filled with steamed sweetened discs of dough - much like char siu bao - accompanied them. A slick of hoi sin and a shard of crackling was placed in it and it was folded over. The warm, soft dough contrasted beautifully with the crisp glass-shatter of the laquered crackling. I had wondered if it would be at all chewy as it wasn't puffed like crackling you'd make at home, but it was completely smooth. All my fears were allayed after that initial mouthful. The pigs were again removed for further portioning of the sweet succulent meat. Man cannot live on pig alone though, so next we had some salt and pepper tofu. 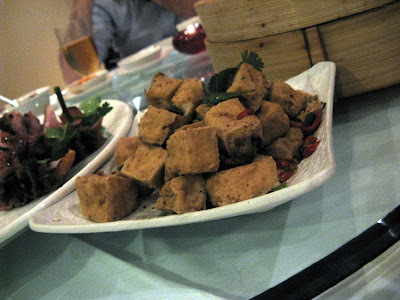 The cubes were perfectly fried and greaseless, with a great tongue-tingling hit of Sichuan pepper, and some crispy squid, which I thought quite forgettable. This could possibly have been due to the arrival of two whole aromatic ducks, which were shredded for us to stuff into pancakes. A fine example of the dish of which we made light work. At this point I started to fret. I was stuffed beyond belief and my shirt buttons strained worryingly. I abandoned my beer for oolong tea to aid digestion, and contemplated some Roman-style purging. Thankfully, after a short period I got a second wind, just as the seabass fried with garlic and soy sauce was placed before me. I preferred the steamed version we also had, with ginger and spring onion as it was a more delicate and fresh flavour, but both dishes were cooked well. The plain fried noodles revolved under my nose without assault. Gai laan (chinese brocolli) stir-fried with garlic was sweet and crisp and the water spinach, stir-fried with garlic and chilli made up for not having my favourite vegetable available, the pea shoots. 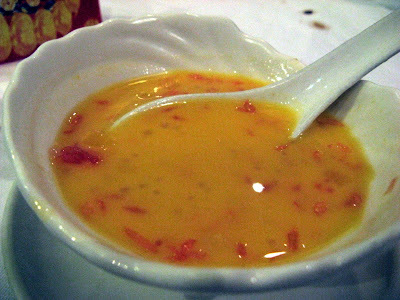 After this much feasting, wewere pretty replete but I couldn't resist some mango and grapefruit pudding with sago. Grapefruit wouldn't be my first choice, but in this instant the bitter sourness was a great palate cleanser and made me feel less full. For the 18 of us, it was probably the heftiest bill I've laid eyes on, but looking back at all the food and merriment we had, it was well worth it. I was given a huge bag of leftovers too - no one wanted them, honest! - which will feed me for days. That's what Chinese New Year is all about. Given the demonstration of excellent service and delicious food, I'll definitely be back to Pearl Liang, even if it is a schlep. Wasn't it a superb night! That drunken chicken - oh yeah. 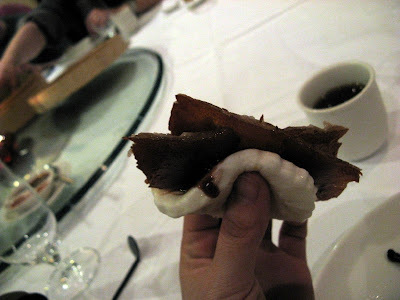 And loved the crackling too. What a wonderful meal. I was so gutted I couldn't make it. I am sure you ate my share for me though. If you didn't, I want to know why not. Oh wow - very nicely written Lizzie. I would have loved to have been invited to this. I seriously know sod all about Chinese food and am always keen to learn more. I also have had Pearl Liang on my radar for a little while. Next time. Now you need to go back for the dim sum! Happy New Year! That suckling pig looks good ! Must come back to Pearl Liang at some point whilst I like the food here, I thought it lacked atmos - mind you that wouldn't a prob for CNY ! wow my god that pig looks boom! It's quite hard to find the place for the first time. Worth the effort for the overall quality of food though. The suckling pigs sound awesome. You know, I tried to book a large group at Pearl Liang for CNY, too, and now I know who beat me to it! gong xi fa tsai, and glad you loved PL. It is indeed, a schlepp, but one I'm glad to make. The place consistently cooks very good Chinese food. That drunken chicken was seriously drunk and shredded jelly fish is like eating elastic bands, which is nice but I wish they'd invent something that's like eating the tops of Biros. Those I can chew on for hours. Hats off to tehbus for organising the feast. It was a great evening. Catty - definitely more chat next time! Greddy Diva - That crackling was amazing. Helen - Of course I did! Dan - Next time, definitely. Maybe a dim sum session. Mr Noodles - I have to say the main room was a bit dull, but that was in comparison to our raucous bunch! Eatmynels - that it was. Wild Boar - I got pretty lost. The pig as great. AAIL - Whoops - stole your table! Happy new year to you. I look forward to trying their dim sum. Gin & Crumpets - Maybe overcooked baby cuttlefish? It was a great evening indeed. Gastrogeek - thanks! It was a feast and a half. I love your blog Lizzie, very refreshing read - will definitely be trying loh bak goh. Makng chilli crabs tonight for born and bred Malaysians tonight. If successful, will let you know!